Definition at line 1157 of file DeclTemplate.h. Definition at line 1251 of file DeclTemplate.h. Definition at line 1252 of file DeclTemplate.h. Definition at line 486 of file DeclTemplate.cpp. 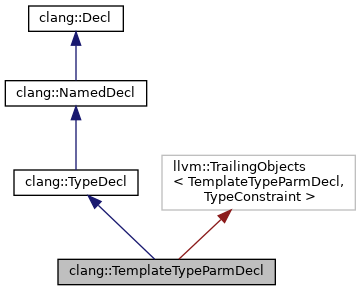 References clang::C, clang::ASTContext::getTemplateTypeParmType(), and clang::QualType::getTypePtr(). Referenced by createMakeIntegerSeqParameterList(), clang::ASTContext::getCommentForDecl(), GetDeclSpecTypeForDeclarator(), and clang::TemplateDeclInstantiator::VisitCXXMethodDecl(). Definition at line 498 of file DeclTemplate.cpp. Definition at line 1214 of file DeclTemplate.h. 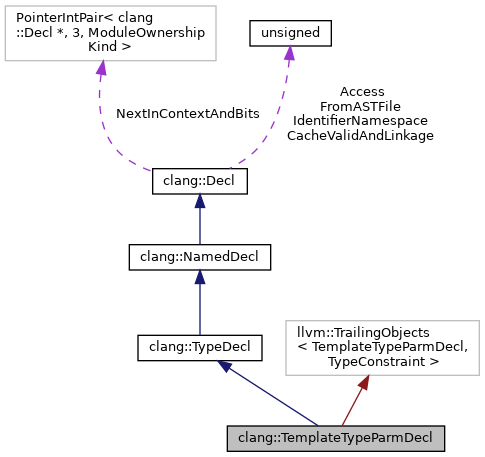 Referenced by clang::TemplateDeclInstantiator::VisitCXXMethodDecl(), clang::ASTDeclWriter::VisitTemplateTypeParmDecl(), and clang::ASTNodeTraverser< Derived, NodeDelegateType >::VisitTemplateTypeParmDecl(). Definition at line 1193 of file DeclTemplate.h. Referenced by clang::ASTNodeTraverser< Derived, NodeDelegateType >::VisitTemplateTypeParmDecl(). Definition at line 1200 of file DeclTemplate.h. Retrieves the default argument's source information, if any. Definition at line 1205 of file DeclTemplate.h. Referenced by SubstDefaultTemplateArgument(), clang::TemplateDeclInstantiator::VisitCXXMethodDecl(), and clang::ASTDeclWriter::VisitTemplateTypeParmDecl(). Definition at line 503 of file DeclTemplate.cpp. Referenced by clang::Sema::CheckTemplateParameterList(), SubstDefaultTemplateArgument(), and clang::TemplateDeclInstantiator::VisitCXXMethodDecl(). Definition at line 517 of file DeclTemplate.cpp. Referenced by checkLiteralOperatorTemplateParameterList(), SubstDefaultTemplateArgument(), clang::TemplateDeclInstantiator::VisitCXXMethodDecl(), clang::TextNodeDumper::VisitTemplateTypeParmDecl(), and clang::ASTNodeImporter::VisitTemplateTypeParmDecl(). Definition at line 521 of file DeclTemplate.cpp. Referenced by checkLiteralOperatorTemplateParameterList(), clang::TemplateDeclInstantiator::VisitCXXMethodDecl(), clang::TextNodeDumper::VisitTemplateTypeParmDecl(), and clang::ASTNodeImporter::VisitTemplateTypeParmDecl(). Definition at line 509 of file DeclTemplate.cpp. Definition at line 1197 of file DeclTemplate.h. Referenced by clang::Sema::CheckTemplateParameterList(), clang::TemplateDeclInstantiator::VisitCXXMethodDecl(), clang::ASTDeclWriter::VisitTemplateTypeParmDecl(), and clang::ASTNodeTraverser< Derived, NodeDelegateType >::VisitTemplateTypeParmDecl(). Definition at line 525 of file DeclTemplate.cpp. Referenced by clang::TemplateDeclInstantiator::VisitCXXMethodDecl(), clang::TextNodeDumper::VisitTemplateTypeParmDecl(), and clang::ASTNodeImporter::VisitTemplateTypeParmDecl(). Definition at line 1231 of file DeclTemplate.h. Set whether this template type parameter was declared with the 'typename' or 'class' keyword. Definition at line 1237 of file DeclTemplate.h. Set the default argument for this template parameter. Definition at line 1219 of file DeclTemplate.h. Set that this default argument was inherited from another parameter. Definition at line 1225 of file DeclTemplate.h. Whether this template type parameter was declared with the 'typename' keyword. If not, it was declared with the 'class' keyword. Definition at line 1191 of file DeclTemplate.h. Referenced by clang::TemplateDeclInstantiator::VisitCXXMethodDecl(), clang::ASTDeclWriter::VisitTemplateTypeParmDecl(), clang::TextNodeDumper::VisitTemplateTypeParmDecl(), and clang::ASTNodeImporter::VisitTemplateTypeParmDecl(). Sema creates these on the stack during auto type deduction. Definition at line 1159 of file DeclTemplate.h.